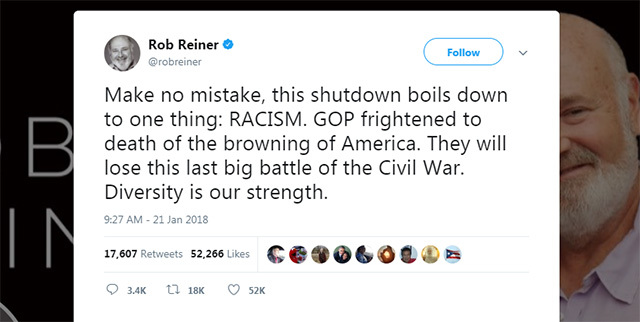 Actor Rob Reiner said Sunday on Twitter that the government shutdown is actually part of a race war over the "browning of America." "Make no mistake, this shutdown boils down to one thing: RACISM," Reiner said. "GOP frightened to death of the browning of America. They will lose this last big battle of the Civil War. Diversity is our strength." 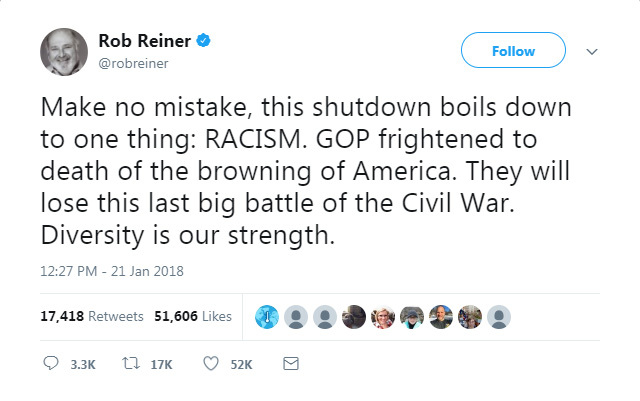 It sure is interesting that Rob Reiner views the "browning of America" as an act of war and "diversity" as a tool of conquest. Note too, he cries "racism" to shut down any resistance on the part of the GOP. Is that what he really means when he says, "Diversity is our strength"? Reiner's racially charged tweet got over 17,000 retweets and 52,000 likes within 24 hours.